This past weekend, my local Half Price Books had a massive clearance sale. They rented out out of the available retail outlets further down in the strip mall where they're located, threw in a slew of folding tables, and dumped books on them. Nothing was marked because everything was two bucks. Grab any book off any table -- two dollars. Every now and again, you could find a very small or thin something or other for one dollar or maybe even fifty cents, but by and large, everything was two bucks. There was some broad categories like Biographies, How To, History, etc. but there was no real organization on the tables themselves. Everything was just kind of dropped wherever there was room. Understandable, of course, since so many of the books were so steeply discounted. That meant that most everyone there was going up and down the tables scanning every title and author; it's not an environment where you can really look for something in particular. And the whole time, employees were stopping by with cardboard boxes full of more books, which would get set on the tables quickly. I wouldn't be mentioning all this if they didn't have a comics section, of course. Lots of comic strip material, especially Garfield , Dilbert, and The Far Side, and lots of manga. Some even in the original Japanese! I managed to find a few other things of interest (seen here). But, on to my point! The basic business model of Half Price Books is that they take books that are no longer viable as normal retail (bought back from individuals, of course, but also remainders and such from publishers) and sell them at a discount relative to the list price. They don't have a great selection of the latest books, but they do have a wide variety of titles you won't find in many other bookstores, many of which are long out of print. For readers, this is great because they can get more reading material at bargain prices. Those of an environmental bent also get something of a warm fuzzy in knowing that they're not contributing to additional deforestation and/or an ever-increasing pile of garbage in the nearest landfill. Nothing really new there so far. Successful commercialization of (niche) flea markets and garage sales, right? These are not just used books. These are used books that Half Price Books can't sell for more than two dollars. They deal largely with publishers' and individuals' overstock, which makes this stuff Half Price Books' overstock! Over-overstock? Kind of the last chance these books have before becoming landfill. I suppose I'm mostly surprised at the sheer volume of material we're looking at here. 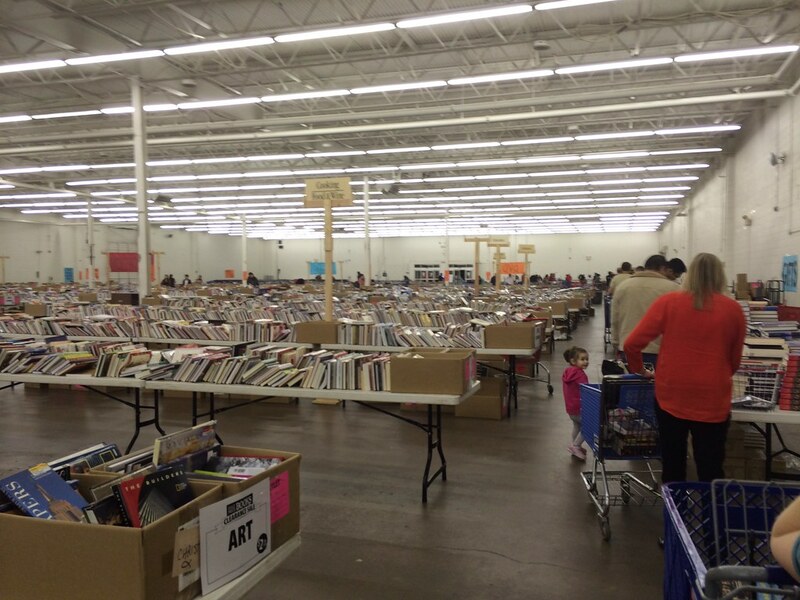 Thousands upon thousands of books, all in perfectly fine condition, that even a bargain seller is having trouble getting rid of. That's a lot of overprinting of books. And it makes me wonder... for as many problems there are with comics' direct market, in particular the issues surrounding pre-ordering from solicitations months in advance that puts most of the responsibility on the retailer instead of the publisher or distributor, I wonder if there's something there that could be used to better serve the book industry as a whole. Because there seems to be literally tons of leftovers at this point that simply are going unsold. That seems like a huge waste of everybody's resources, so I wonder if there's something to comics' print-to-order approach. Finding books for solving your personal life problems, and looking for getting a perfect tip which can help you to groom your life by yourself then you can get the variety of books from here at this http://drjeffwrites.rf.gd/. These books will help you to solve your business, property, and marriage related problems by following the guidance and support of these you can groom yourself very quickly.